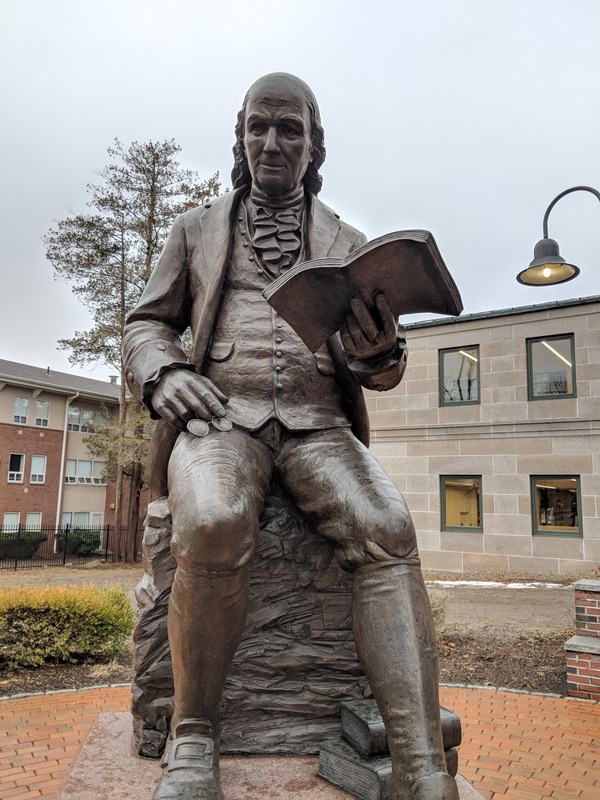 Franklin Matters: In the News: Ben's books return to display; Smith family appear in "Little Mermaid, Jr"
In the News: Ben's books return to display; Smith family appear in "Little Mermaid, Jr"
"Sometime in 1782 or early 1783, Benjamin Franklin received a curious request from “a new town in the state of Massachusetts” that “having done me the honor of naming itself after me, and preparing to build a steeple to their meeting house,” asked if the statesman would give them a bell. But, being a practical man, the 77-year-old Ben Franklin “advis’d the sparing themselves the expense of a steeple” and suggested “books instead of a bell, sense being preferable to sound.” He explained as much in a March 18, 1783 letter to his friend Dr. Richard Price, directing him to collect a list of “a few good books to the value of about 25 pounds” - including Price’s own works - to be delivered to the town. Fast forward about 235 years to this Sunday, April 8, when the Franklin Public Library will unveil a new display of those books - the volumes that inspired creation of what is thought to be the nation’s first public library. The exhibit is one of the new features in the newly renovated reading room in the old part of the library building at 118 Main St.
“This will be the first time the full collection of books will be on a 360-degree display,” noted Deputy Town Administrator Jaimie Hellen in an email about the event, which takes place from noon to 2 p.m.
"It’s all in the family when the curtain rises on “Little Mermaid, Jr.” April 6 at Bellingham’s Marketplace Theatre. Franklin High sophomore, Rosalyn Smith, leads the company, starring as love-struck mermaid Ariel, who pines to leave her home fathoms below and join Prince Eric and become part of his world above the sea. Supporting her in her quest is fishy side-kick (and real life younger brother), Noah Smith, who portrays Flounder. Noah is a 8th grader at Horace Mann Middle School. Not to be forgotten is another member of the Smith family, little sister Delaney, a 4th grader at Oak Street Elementary School, who plays swashbuckling Grimsby, part of Prince Eric’s loyal crew. In addition to the contributions of the Smith family, there are also 20 more young actors from Franklin -- including Andrew Falanga as Chef Louis, Caitlin Hickey and Mackenzie Atwood as Mersisters -- and from surrounding communities, including Medway, Bellingham, Holliston, Framingham and towns in Rhode Island."